When October began, we went full speed on pumpkin spirit, and we haven’t stopped since. We can’t help ourselves! One post just isn’t enough to spread all the good pumpkin news. Let’s rehash: So far we’ve told you about all the fun at our pumpkin patch, the important message we support from our partner Spookley the Square Pumpkin, and a handful of crave-worthy pumpkin recipes. We also helped clear up the confusion about what exactly a pumpkin is, fruit or vegetable. Bear with us—we have one more important pumpkin topic to cover. With Halloween coming up in less than one week, now is prime time for pumpkin carving. For those who’ve already put out jack-o’-lantern, you might find them getting soggy soon. Pumpkins have a porch life of around ten days, maybe a couple more. If your pumpkin isn’t holding up, don’t fret—our patch is still full! If you need a little help with carving, this page has some great templates and carving tips. And don’t forget to save your pumpkin seeds. They’re great for snacking. In recent years we’ve noticed a new trend, layering, which uses pumpkins of different sizes and colors to decorate porches and yards for fall and Halloween. It’s another great thing about this time of year: Just about every house is home to a pumpkin in some shape or form. It’s fun to walk or drive around and admire our friends’ and neighbors’ creations. Speaking of admiring, we want to see what you’ve done with your Orr’s pumpkins this fall. Whether it’s in pies or on porches, share your photos on our Facebook page. https://orrsfarmmarket.com/wp-content/uploads/2016/10/pumpkins2.jpg 1840 3264 Orr's Farm Market https://orrsfarmmarket.com/wp-content/uploads/2017/03/Orrs_WebHeader_2017-1.png Orr's Farm Market2016-10-25 10:11:042016-09-21 10:32:49Pick, Carve, Repeat. We’re pumpkin crazy. Needless to say, it started long before this pumpkin spice business. Who knew a particular collection of complimentary flavors could ruffle so many feathers? It seems most people are either for pumpkin spice or against it. We don’t have an official position on the subject. All we’ll say is if it involves pumpkins and it makes people happy, it’s okay by us. As we all know, October is prime time for pumpkins. This month, we want to get back to the basics. We want to spread the word that there’s no pumpkin like one plucked fresh from the patch. While we’re at it, we have to address a common question. People often ask if a pumpkin is a fruit or a vegetable. Technically, the pumpkin is a fruit because it grows from the flower of the plant. However, pumpkin isn’t sweet on its own, and because of that it’s generally treated like a vegetable. In short, pumpkins are just agreeable! They get along great with casseroles, cakes, cookies, breads, muffins, stews, and soups. They have a longstanding love of ice cream too (who doesn’t love a pumpkin pie milkshake?). They also enjoy hanging out on porches and in place settings. To sum up our undying love of all things pumpkin, we’ve gathered five recipes you should try this fall. And don’t forget the all-important first step: Head down to the farm to pick your very own! Try these pumpkin recipes this season! Meet You at the Patch! Are you as excited about October as we are? It’s a unique time of year because of its connection to farming. How so? Hayrides and pumpkins, of course. You can’t have either without a farm! We’re ready for a month of carving toothy orange smiles and makin’ tracks to the patch. Our pumpkin patch is the centerpiece of the month’s activities. 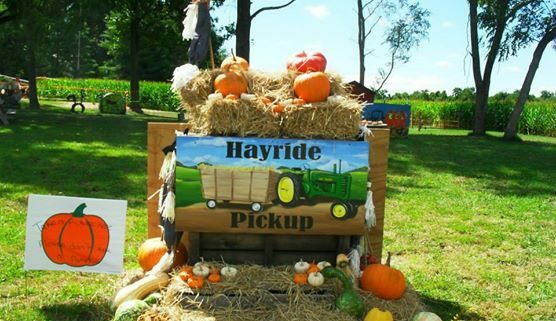 Hayrides are a must this time of year, for big kids, little ones, and grownups too. Take a ride to the patch where you can pick your own pumpkin, whether it’s for a jack-o’-lantern to adorn the porch or a pie to satisfy a sweet tooth. The fun doesn’t stop there. We also have a corn maze, fall- and Halloween-themed photo setups, goodie bags, and more. Check out our pumpkin patch page for details. We’re also excited to partner with Spookley the Square Pumpkin. Spookley is a cartoon character and the official spokespumpkin for National Bullying Prevention Month. Throughout the month of October, we’ll feature Spookley in events around the farm to help our younger visitors understand the importance of being tolerant and kind. It’s a great opportunity for families and educators alike. October is a special time to visit the farm. Smiles abound, whether carved on a pumpkin, painted on a scarecrow, or spread across the faces of our littlest visitors. Come on down, hop on the wagon, and enjoy the ride! https://orrsfarmmarket.com/wp-content/uploads/2016/09/Pumpkin-Patch.jpg 720 960 Orr's Farm Market https://orrsfarmmarket.com/wp-content/uploads/2017/03/Orrs_WebHeader_2017-1.png Orr's Farm Market2016-10-12 16:48:372016-09-20 16:49:19Meet You at the Patch! Fall’s familiar coziness continues. We’re sipping hot apple cider, snacking on baked goods from the market, and smiling at all the children bounding through the pumpkin patch. As October comes to an end, we look forward to more fun at the farm. After Halloween, we keep the wagon wheels turnin’ with group bonfire hayrides. Grab your hoodie and hop into a wagon for a 45-minute early (or later) evening ride through our fields and orchards. Then get comfortable on a blanket or lawn chair with your favorite fall snacks and drinks for an hour-long bonfire in our woods. Tell stories. Have some laughs. Enjoy the crackle of the fire and the pretty colors of the evening sky. Our bonfire hayrides are a unique way to enjoy the season. Try something different this year! This is a great group activity for families, churches, nonprofit organizations, and coworkers. For the Orr Farm family, it’s an opportunity for us to share our beautiful grounds with visitors. To get more information, click here or email us at info@orrsfarmmarket.com. As always, we hope to see you soon! https://orrsfarmmarket.com/wp-content/uploads/2016/09/Hayride-Sign.jpg 417 556 Orr's Farm Market https://orrsfarmmarket.com/wp-content/uploads/2017/03/Orrs_WebHeader_2017-1.png Orr's Farm Market2016-10-02 16:30:312016-09-20 16:41:52Fall Fun for Everyone!